Night Nanny, Baby Nurse Toronto, Calgary & Vancouver New Mummy Co. The New Mummy Company’s goal is to provide you with trusted and professional support throughout the term of your pregnancy, at the time of the birth and in those special months when you bring home your bundle(s) of joy. All of our services are tailored to support you in the comfort and privacy of your own home. We recognize that bringing home a newborn can be a time of upheaval and sleep may also be in short supply. This is why we are here to help. Our expert services provide you with guidance and reassurance you crave in advance of the birth while our Night Nannies are there to support you in the postpartum period to ensure you and your family a great night’s sleep. We understand how overwhelming pregnancy and life with a newborn can be. Whether you require a Prenatal Parenting Class, a Night Nanny or a Lactation Consultant, we have an amazing and compassionate team on hand to provide you with the support you and your family need. Ensuring you and your baby a comfortable, relaxed and confident start in life. We are unique in that all our services are offered in the comfort and privacy of your own home, we will work with you to create a custom care package to suit your family’s individual needs. We have built a range of services designed to take you through from pregnancy to parenthood. The New Mummy Company team have been handpicked by founder & childcare expert Maria Robertson based on their skills and expertise. We offer a wide variety of services including Night Nannies, Lactation & Breastfeeding Consultants, Prenatal Education, Birth & Postpartum Doulas, Newborn Nannies, CPR Training & more. We are constantly keeping up to date on the latest trends and advice relating to all aspects of pregnancy and newborn care. We are leaders in this aspect with owner Maria organizing and hosting a successful international Night Nanny conference in the UK attended by Night Nannies from all over the world. We are here to be your comfort blanket and our services will provide quality and trusted support for you and your baby. The New Mummy Company’s speciality is Night Nannies, but what exactly is a Night Nanny? A Night Nanny can also be known as a night nurse, baby nurse or sleep doula and in Europe they are better known as maternity nurses you can read more on our Night Nanny page. Our professional team of Night Nannies care for your baby overnight undertaking nursery duties, assisting with breastfeeding and pumping, baby laundry, settling your baby to sleep while documenting the nightly events. Our experienced Night Nannies have the following qualifications Registered Nurse, Registered Practical Nurse, Paediatric Nurse, Doula, Registered General Nurse or Midwife. You can therefore rest easy and get a great night’s sleep knowing your baby is in safe, caring hands. We are passionate about providing the best standard of care possible. We ensure you have complete peace of mind with the person you have invited into your home to care for you and your baby. Our onboarding process is stringent and all of our team members follow the same thorough screening. This includes identity checks, police & background checks, minimum of three reference checks, qualification verification, in person interviews and finally a full day orientation prior to joining the team. We believe our Night Nanny orientation is unique to The New Mummy Company. This one day classroom training session run by owner and internationally renowned baby nurse & sleep consultant Maria Robertson is where all aspects of the Night Nanny role are reviewed and the core values of The New Mummy Company are passed on. We’ve hired Maria on three separate occasions and each time she has brought her special mixture of affection, knowledge, hard work and strength into our home. My wife, my daughters and I are always excited when we know Maria’s coming to stay — she allows the entire household to operate smoothly, with proper sleep schedules and scrumptious meals. Coming into a family sometimes wary of outsiders, Maria made herself an insider within a few days, and we miss her greatly when she’s gone. Maria is the Baby Whisperer. She is extremely knowledgeable about infants and small children — they immediately respond to her confidence and warmth, and she gets them gently but firmly on a solid schedule. Both our three-year-old and our 10-month-old love her. And as an added bonus, she is an absolute pleasure for the grown-ups to have around as well. A fantastic woman who is fantastic at what she does. The New Mummy Company saved the day for us. Our daughter really struggled to sleep from day 1 and my wife was up for basically 3 months straight. If it wasn’t for Maria’s expertise, kindness, and soothing nature, we would not be the rested happy family we are today! 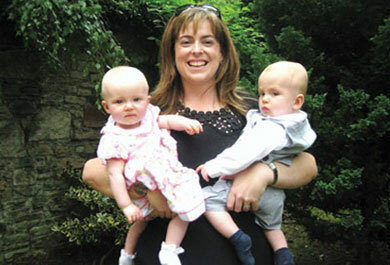 We were very fortunate to contact Maria and The New Mummy Company. Maria is kind, very knowledgeable and is always available for information regarding baby care. We were staying with our infant son in Toronto and needed assistance and a night nanny, and Maria got us both right away. This made our stay so much easier, and was a huge help for our baby. We highly recommend Maria, who is fast, trustworthy, professional and always there for you. Paola + Darren + Félix.